For the caregiver of a person with Alzheimer's disease, every day can be an unpredictable challenge. The symptoms of Alzheimer’s, the most common form of dementia, can include cognitive disruptions such as severe memory loss, difficulty in planning or problem solving, general confusion with time and place, decreased or poor judgment, withdrawal from one’s normal life activities, and mood or personality changes. Because dementia symptoms can vary so dramatically from one day to the next, caregivers are often unable to predict and keep up with the needs of their loved ones. SimplyHome’s technology can help address the concerns of the Alzheimer’s caregiver, diminishing emotional and financial strains and creating greater peace of mind. Additionally, remote support systems can help distribute the tasks of caregiving among multiple family members. What if my mother forgets to take her medication? What if she no longer remembers to complete important tasks on her own? What if my loved one does not remember to turn off the stove? How will I know if my father leaves the house, wanders off, or falls? If I can’t be there around the clock, how do I know if my loved one is okay? Secure medication dispensers can provide reminders to individuals to take their medications, and alerts to caregivers if their loved ones forget. The SimplyHome System can be customized with verbal reminders that cue daily routines, such as reminders to brush teeth, get out of bed, wash clothes, or take medications. The SimplyHome System can alert caregivers based on cooking safety concerns, such as the stove being left on for a selected period of time. Based on the activities in each room in the house, the sensor-based systems can issue alerts to caregivers. For example, if a loved one gets up to go to the bathroom at night but does not return to bed within a specific timeframe, a caregiver can receive an alert. Loved ones who are at risk for falling or wandering can utilize Personal Emergency Response Systems (PERS) or be supported by motion-sensor based technology that can alert caregivers of potentially dangerous activity or inactivity. Caregivers can remotely check on their loved ones’ activity or inactivity in the home, by using SimplyHome's secure web portal. 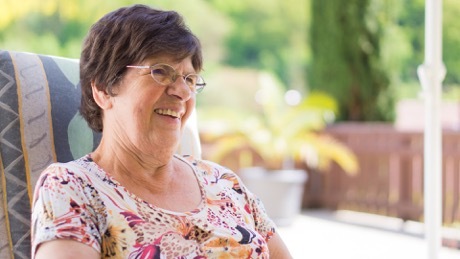 For the Alzheimer’s caregiver, assistive technology can create a stronger safety net for their loved one, allowing the caregiver to receive alerts when additional support is needed. These alerts can be sent to multiple family members, enabling families to distribute caregiving responsibilities and take better care of themselves – and their loved ones – in the long run. Ready to talk? Contact us for a free assessment and plan for how we can help you support your loved one's needs.